Photo by Alex Vejar | The Salt Lake Tribune. Snow Canyon players celebrate their 1-0 overtime win against Orem on Saturday in the state 4A girls soccer championship game at Rio Tinto Stadium. Sandy • Saves. Clearances. Tackles. Missed opportunities. 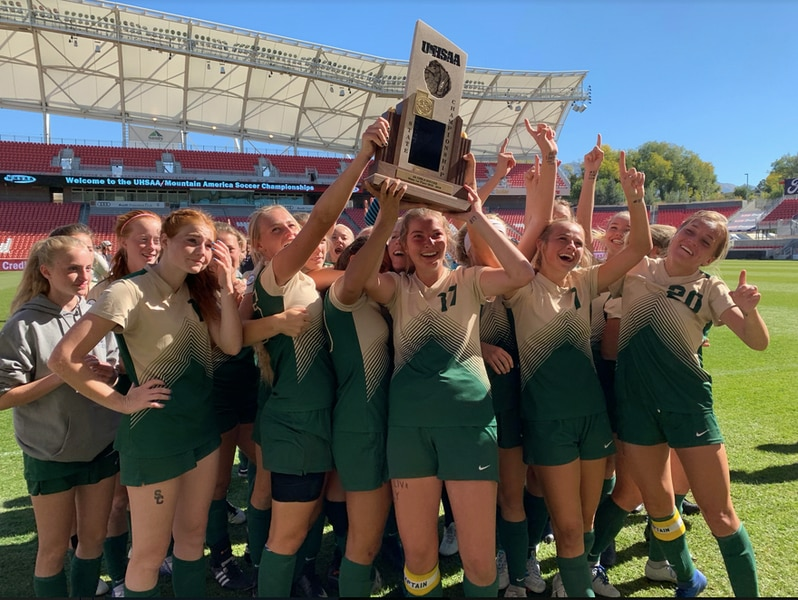 That’s most of what the Orem and Snow Canyon high school girls' soccer teams gave each other for much of the Class 4A state championship game on Saturday at Rio Tinto Stadium. That is, until about midway through the first 10-minute overtime. The Warriors broke into a counterattack with Rachel Durante dribbling up the right side of the field. The entire Orem defense shifted to that side, along with its keeper. Durante saw the coverage and crossed it to Heidi Smith, who was wide open. It was a sequence Snow Canyon had practiced all season. Smith finished the cross from Durante to lift the Warriors to a 1-0 win and their first state championship since 2012, when the school was in Class 3A. Snow Canyon had competed in the semifinal round of the championship tournament the previous four years, but come up short each time. The seniors on the team have bonded through those experience over the years, Smith said. Warriors coach Kenneth Kunde was emotional when he spoke of what the win meant for that group of seniors, and compared the group to the seniors that won the 2012 title. The game was scoreless at the end of regulation. Orem’s Taye Raymond had a clean look at a goal in the 77th minute, but her strike pinged off the crossbar. It was the closest either team got to scoring in regulation. Orem had not allowed a single goal in the entire postseason tournament coming into Saturday. Each of the games it had won was a 1-0 decision, two of them coming in overtime periods. But Snow Canyon managed to break Orem’s postseason shutout streak. “Our defense just rocked,” Smith said. Smith scored her 22nd goal of the season, while the Warriors ended their season on a 13-game winning streak and with only one loss.